Now you can Soup Up your Nashville Telecaster to get more pickup tone power and also increase your creativity and versatility with dozens of additional fresh new pickup tones. Your stock Nashville Telecaster is designed to give you a modest and inadequate 5 pickup tones. Don't you think it's worth a few dollars more to get a Grand Canyon Wide range of 35 Blues, Jazz, Metal, Surf, Country  plus the dozens of new and different pickup tones your stock guitar simply cannot produce? It takes fifteen minutes to remove your stock control plate and connect your pickup wires to the upgrade's solderless terminal strip. Now a HUGE, alternate tone dimension will instantly open up to you. Special Update: Select upgrades now include Treble Bleed circuitry plus high quality polypropylene tone control capacitors (with a superior linear frequency response) for unequaled versatility. These upgrades give you "American Pro Telecaster" performance from your stock guitars. You will still have your original 5 pickup tones, but you will have 30 additional unique (35 total) pickup tones. This upgrade also gives you those Brian May (guitarist for Queen) "red special" pickup sounds because you can instantly put any two or all three pickups into series (you cannot do this on your standard Nashville Telecaster.) And when you put two select pickups in series, you can turn on the remaining pickup in parallel (either in normal-phase or reverse-phase) and this is something even Brian May's guitar cannot do. This upgrade will give you incredible pickup tones that are so "Fat"  they're OBESE! This Nashville Telecaster upgrade gives you total control over your pickups. Because you can independently control each pickup, you can turn each one On in normal-phase or reverse-phase, and you can also put them in Parallel-connection or Series-connection with one or more pickups. You will get 35 pickup tones from your upgraded Nashville Telecaster that currently only has five pickup tones. This upgrade gives you the Signature Sounds of all guitar gods of every headliner group since the 1940s. When used In The Studio, your AweSome upgraded Nashville Telecaster will have an incredible spectrum of 35 unique pickup tones that are impossible to produce with a "stock" instrument. When used On Stage, your upgraded Nashville Tele gives you incredible pickup tones that nobody else can easily duplicate. Over time, you can "morph" your Signature Sounds to keep your fans interested in what you offer. This page has MP3 sound clips to let you hear the result our T3Plus-Switch upgrade offers you. One Telecaster Upgrade complete with our T3Plus-Switch and VT-2 Volume/Tone control. 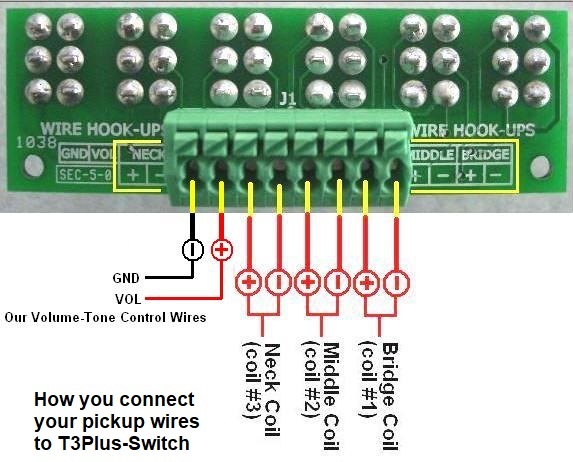 You connect your pickup wires to the green solderless terminal strip and connect the two marked upgrade wires to your output jack. Instruments with HS or SH pickup configuration require a 4-wire humbucker pickup.